A transparent plastic glass is filled with water. Immediately you cover the rim of the glass with a piece of paper turn the glass upside down. The liquid remains in the glass! 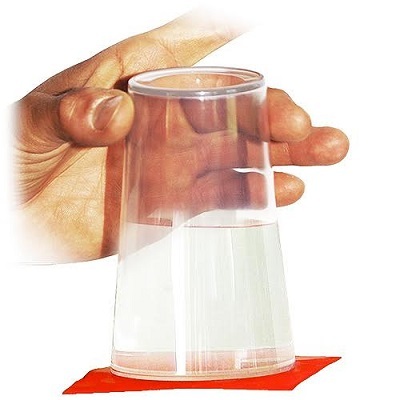 Then the magician removes the paper… and the liquid still remains in the glass! After that, the magician announces that the liquid will fall… and following the magician's words the liquid falls! The glass is made from excellent quality plastic, is 3,6" tall with a diameter of the mouth of 2,6".